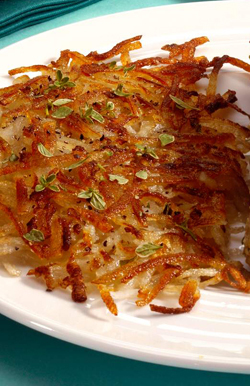 Served alongside a veggie quiche, vegans and nonvegans alike enjoy hash browns for breakfast. You can caramelize your onions and make your potatoes as crunchy or soft as you prefer. Place the grated potatoes on a lint-free tea towel, roll it into bundle, and squeeze hard to get as much moisture out as possible. Place the squeezed potatoes into a medium mixing bowl. Repeat for the onions and then mix the potatoes and onions with your hands. Heat the oil in a large 12-inch skillet over medium-high heat. When the oil is hot and shimmering, but not smoking, add the potato and onion mixture in four equal pancakes, spreading it out with a spatula or fork to break up any clumps. Sprinkle the pancakes with the salt and pepper and cook for 5 to 7 minutes. Make sure the heat isn’t too high: You want the bottom to brown, but you also want the inside to cook through before the crust burns. Lift up the edges of the potatoes and check whether they’re beginning to brown; if they are, flip them over. Continue to cook until the pancakes are golden brown on the bottom, about 3 to 5 minutes. As an alternative to the tea-towel method, you can put 1 cup batches of the shredded potatoes in a potato ricer and simply squeeze the moisture out by pressing the plate down. Per serving: Calories 410 (192 from Fat); Fat 21g (Saturated 2g); Cholesterol 0mg; Sodium 595mg; Carbohydrate 52g (Dietary Fiber 5g); Protein 5g.